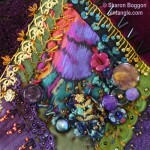 Today I would like to share a detail on block 74 of the I Dropped the Button Box Crazy Quilt. If you click on the thumbnail you will be taken to a free pattern of the block and information about the fabrics I used when I made up the block. This is a detail on the block. I first worked a line of buttonhole stitch in perle #5 cotton and then in silk thread I added French knots and cast on stitch loops. 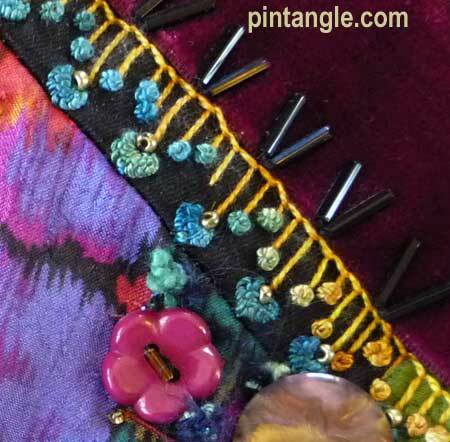 The seam was then finished with seed beads and bugle beads. Did you do the tatted lace yourself? I am just learning to tat again after many years away from it, and I think that the tatting really adds to that seam. No Joyce the tatting was from a friend who knew I would use it!